Sunchokes in white cheese sauce AND sautéed sunchokes. Ideal with Christmas, Thanksgiving, or roast dinners. We begin by making the roux. Melt one stick of butter in a saucepan. Grind in one teaspoon of black pepper (or to your palate). As soon the butter melts, add one cup of flour. Stir in the flour so that it absorbs all butter. Stop stirring and let the roux heat for about 15 seconds before stirring again. Let it sit again for another 15 seconds, before adding one fifth of the milk. Pour in milk. Let the milk heat slightly (about 15 seconds) before stirring into the roux. Once the milk has been absorbed by the roux, add another fifth of milk. Again, let the milk heat slightly (about 15 seconds) before stirring into the roux. Once the milk has been absorbed by the roux, add another fifth of milk. Now a sauce will well and truly being forming. Stir until all ingredients are combined before adding another one fifth of the milk. Combine all ingredients and then add the remaining milk. Combine all ingredients. If any lumps form, use a hand held automatic whisk to combine all ingredients into a smooth white sauce. There should be no lumps. Slowly add all cheeses and stir in. Once the cheeses have melted, the sauce is ready. Set aside. Turn the oven onto 350. Wash the sunchokes thoroughly. Slice into thin slices so that they are similar in dimensions to a quarter (coin) or larger (but not thicker). Lay the sunchokes on a porcelain or glass baking dish that is oven proof as well as idea for serving. Sprinkle the parsley over the sunchokes. Pour on the cheesy white sauce. Place the dish in the oven for 20 minutes. Remove and grate on the extra parmesan cheese. Return to the over for 10 minutes. Voila, the yummy dish is made!! Wash the sunchokes thoroughly. Slice into thin slices so that they are similar dimensions to a quarter (coin) or larger. Slice and dice garlic or use a garlic crusher and empty contents into a sautéing pan. Pour in the extra virgin olive oil and the sunchokes. 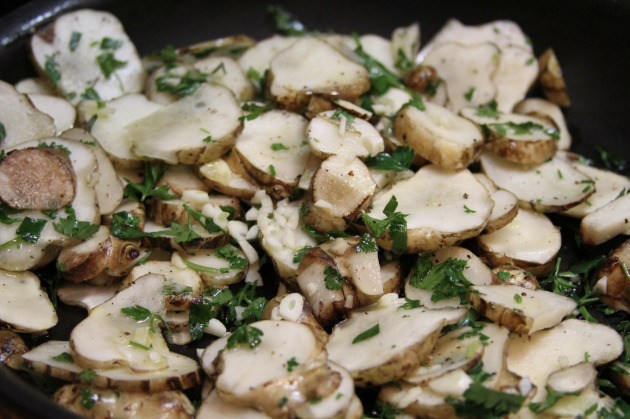 Before placing on a medium heat, throughly stir and coat the sunchokes in the olive oil. Add the parsley and place on stove. Saute until the sunchokes are golden brown on either side. Add ground black pepper to taste. Serve! I boiled fingerling potatoes for 10 minutes, strained and cut them long ways into fours. I placed the potatoes in a tin foil baking dish and massaged one tablespoon of extra virgin olive oil into the potatoes before sprinkling with cracked sea salt, garlic salt and cracked black pepper. I placed the tin foil dish onto the grill of the barbecue and closed the lid. I cooked for a bit longer. I also added parsley, green onions and red onions before retuning the potatoes to the barbecue and closing the lid. Once golden brown, remove and enjoy. Combine ingredients & toss in large bowl. Prepare dressing for mixing. I did not dress the salad. I let our guests dress the salad themselves. They loved every bite of this delish summertime favorite. I soaked a large handful of spears in the juice from one lemon and then splashed on some extra virgin olive oil and cracked black pepper before grilling on the barbecue for only 2 minutes. This meal needs only a very simple salad. Combine a hand full of arugala, with butter lettuce, cherry tomatoes cut in half, feta cubes, cashes and a sprig of basil. Baby Broccoli on the BBQ is the most scrumptious of vegetables. Soak the baby broccoli in extra virgin olio, cracked black pepper & cracked sea salt flakes before placing on the BBQ for 30 seconds on either side. Crispy deliciousness. I cooked the quinoa in Telma stock cubes and water as I prepared the yummy added ingredients. The ratio is one cup of quinoa to 2 cups of water. It takes 15-20 minutes before it becomes fluffy when stirring a fork though the grain. I sautéed 2 red onions, 12 green onions & 3 cloves of garlic in one table spoon of extra virgin olive oil and then stir the onions into the cooked quinoa. I added one bunch of finely sliced European parsley, one quarter of a cup of sliced basil, one half of a cup of raisins, one half of a cup of crumbled feta, and one half of a cup of pine nuts cooked until golden brown. I then added ground Himalayan sea salt & cracked black pepper to taste. ** To roast pine nuts -- I place in a shallow pan and cook over a medium heat and constantly shake the pan (in a back &forth motion) until golden brown.